Coastal Crete Engraving can transform your interior and exterior concrete surfaces! Through the creative use of pigmented stains, sealers and custom engraving we can revitalize walkways, driveways, patios, pool decks and more! Myrtle Beach concrete engraving by the best. If you want the best Myrtle Beach concrete engraving call Coastal Crete today. 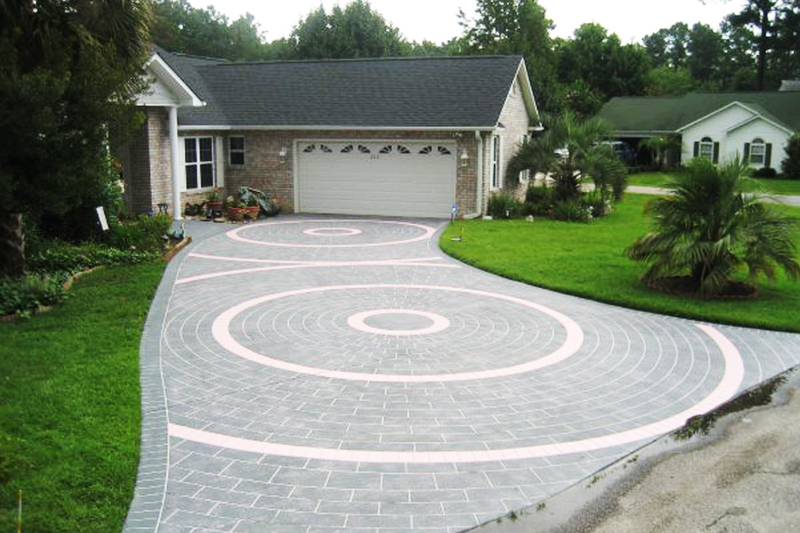 The most experienced Myrtle Beach concrete engrgraving you will find. When you are looking for a Myrtle Beach concrete engraver look no further. We have the highest quality Myrtle Beach concrete engraver in the area. You want concrete engravers with knowledge and experience. Take a look at our work that we have done over the years. In our gallery you’ll see the many different styles of work we offer. Have any questions or concerns about the kind of work we perform? You’ll find the answers you’re looking for here. Coastal Crete Engraving offers a variety of professional concrete staining and refinishing services. Enhance and beautify your home or office! Concrete doesn’t have to be boring. Now you can transform drab, grey, lifeless surfaces into something more welcoming and beautiful. Envision tile, brick, marble, flagstone or even cobblestone at a fraction of the cost! We also specialize in custom logos, emblems and graphics to add the perfect finishing touch to your concrete resurfacing project. For the best Myrtle Beach concrete engraving, contact Coastal Crete Engraving today! Myrtle Beach weather can be hard on concrete. Any concrete you have in Myrtle Beach should be protected. Why not choose the top Myrtle Beach concrete engraving company?